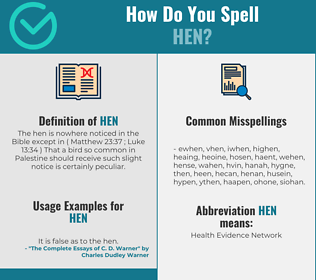 How Do You Spell HEN? 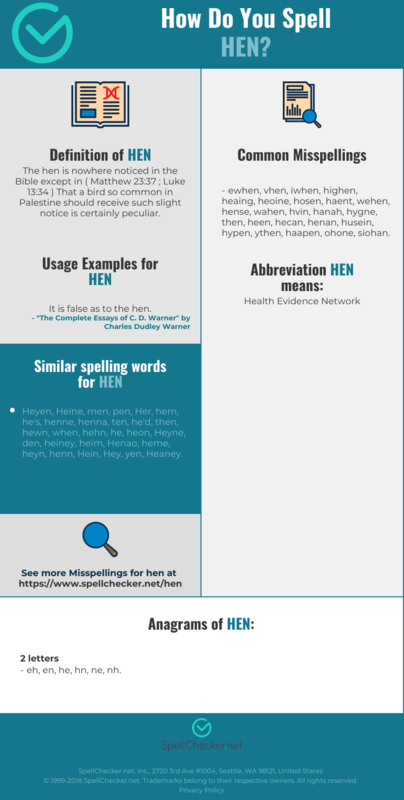 Correct spelling for the English word "hen" is [h_ˈɛ_n], [hˈɛn], [hˈɛn]] (IPA phonetic alphabet). Below is the list of 364 misspellings for the word "hen". The hen is nowhere noticed in the Bible except in ( Matthew 23:37 ; Luke 13:34 ) That a bird so common in Palestine should receive such slight notice is certainly peculiar. What does hen stand for?